Recently, the prominent role of the cell adhesion molecules neurexin and neuroligin in the assembly of synaptic proteomes at newly formed synapses was realized (see Chapter 7). Neuroligins are transmembrane proteins found in the somatodendritic neuron compartment. They were demonstrated to be capable of inducing the recruitment of neurexin to future presynaptic terminals, even when they are heterogeneously expressed in, and presented by, non-neuronal cells49. Neuroligin 1 is preferentially associated with glutamatergic postsynaptic domains50 while neuroligin 2 exerts its function mostly in y-aminobutyric acid (GABA)ergic synapses51. Unfortunately, little is known about the potential contribution of protein kinases to neuroligin-neurexin-dependent signaling, i.e., the direct intermediaries of synapse assembly. 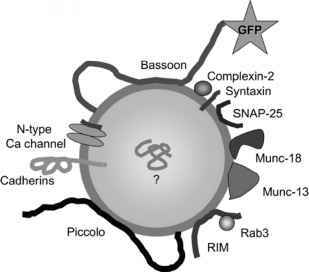 The formation of synapses, however, not only requires the respective elements to meet and to interact via cell adhesion molecules, but also involves the recruitment of a number of proteins to both pre-and postsynaptic loci, which consequently enables the future synapse to acquire a functional status. In general, protein kinases add to this in a modulatory way. At presynaptic sites for example, the synaptic recruitment of the vesicle associated proteins synaptophysin and synapsin I is enhanced in response to FGF-2 signaling and concomitant MAPK activation45. Further, PKC activation was clearly shown to be sufficient for formation of glutamatergic synapses and for recruitment of synaptophysin and synaptotagmin I, a presynaptic vesicle protein required for Ca2+-regulation of neurotransmitter release probability, to newly formed presynaptic terminals32. Using in vivo fluorescence microscopy, Cohen-Cory and colleagues could nicely show that BDNF stimulates the formation of glutamatergic synapses and enhances recruitment of synaptobrevin II, which is also part of the presynaptic vesicle fusion machinery52. Presumably via TrkB receptor signaling, BDNF further stimulates the recruitment of synapsin I to future presynaptic glutamatergic terminals53. In this case, however, the overall amount of synapsin I expression remained unchanged, indicating that the BDNF stimulates the presynaptic recruitment of synapsin I rather than its overall expression level. Thus, protein kinases contribute to the functional adjustment of presynaptic terminals. Another example of this was given by the discovery that noradrenergic activation of presynaptic P-adrenoreceptors engages PKA activity, which leads to increased loading of GABA into presynaptic vesicles and to enhancement of synchronous and asynchronous GABA release from presynaptic terminals of cerebellar interneurons54. On the other hand, adenosine A! receptor-mediated signaling was shown to converge into, and to downregulate the cAMP/PKA-signaling pathway and, thus, to contribute to presynaptic inhibition of spontaneous GABA release55. Therefore, once again, the relative activation status of protein kinases, such as PKA, is controlled by many different factors, and it is the relative amount of active kinases within a highly intermingled kinase network that determines the net kinase function56. The assembly of a functional synapse, thus, not only involves the assembly of presynaptic proteomes, but also relies on a number phosphorylation events, which are implicated in the functional adjustment of the presynaptic release machinery to physiological cues from the extracellular milieu. Of course, on the other side, i.e., the postsynaptic membrane, protein kinases also modulate the recruitment and functional adjustment of postsynaptic proteome constituents (summarized in Table 1).